Mutualistic associations such as the fungal farms of insects are prone to parasitism and are consequently vulnerable to attack by weeds and pests. Therefore, efficient farm management requires quick detection of weeds for their elimination. Furthermore, if the available weedicides are non-specific, then the ability of insects to discriminate between crop and weeds becomes essential for targeted application of such compounds. Here, we demonstrate for the first time in fungus-farming insects, that worker castes of the fungus-growing termite Odontotermes obesus discriminate between their crop (Termitomyces) and the weedy (Pseudoxylaria) fungi, even if exposed to only fungal scents. Termites respond to the presence of fungal mycelium or scent alone, by burying the weed with the offered material such as soil or agar, possibly anointing the weed with chemicals in the process. The scent profiles of crop and weedy fungi are distinct and the differences are likely exploited by termites to selectively mount their defences. Sesquiterpene compounds such as aristolene and viridiflorol, which are absent from crop odours, may constitute the “weedy scent”. 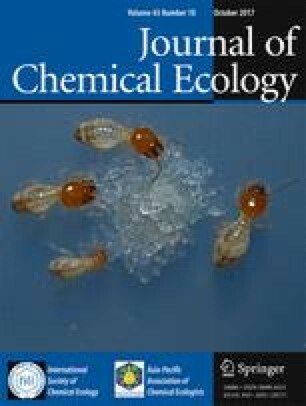 Our results provide a general mechanism of how other fungus-farming insects could avoid indiscriminate application of non-specific fungicides which could lead to poisoning their crops, and have bearing on the stability of the mutualism between termites and their crop fungus in the face of parasitism by weedy fungi. The online version of this article ( https://doi.org/10.1007/s10886-017-0902-4) contains supplementary material, which is available to authorized users. This research was funded by the Council for Scientific and Industrial Research (37(1561)/12/EMR-II), the Ministry of Environment, Forests & Climate Change, the Department of Biotechnology, and the Department of Science and Technology-FIST, Government of India. We are grateful to C Viraktamath and Rashmi Shanbhag for termite identifications, Yuvaraj Ranganathan for help in Random Forest analyses, Srinivasan Kasinathan and Aprajita Sharma for GC-MS work, Tejas Murthy for providing processed soil, Yathiraj Ganesh for field work, Sunitha Murray for administrative support and Mahua Ghara, Nirmal Borkar, Kavita Venkataramani and E S Anupriya for help in weighing.